The dawn-to-dusk \'Karnataka bandh\' called by Kannada outfits to protest release of Cauvery water to Tamil Nadu today disrupted normal life in the city and river basin districts even as window-panes of some buses were damaged in stone-pelting incidents. The dawn-to-dusk 'Karnataka bandh' called by Kannada outfits to protest release of Cauvery water to Tamil Nadu today disrupted normal life in the city and river basin districts even as window-panes of some buses were damaged in stone-pelting incidents. In Bangalore city, some persons pelted stones on some Bangalore metropolitan transport Corporation buses and damaged its window panes, police said. As per initial reports, the bandh has evoked good response with normal life affected in Bangalore, and Cauvery basin districts of Mandya, Mysore, Hassan and Chamarajanagar. In Bangalore, country's IT capital, roads which are generally choc-a-bloc with traffic wore a deserted look with people preferring to remain indoors barring few morning walkers. Some persons, who had come to visit the city, were seen stranded at railway stations and bus stands with buses belonging to Karnataka State Road Transport Corporation (KSRTC) and Bangalore Metropolitan Transport Corporation and even autorickshaws remaining off the roads. Activists belonging to pro-Kannada organisation, Karnataka Rakshana Vedike, staged protest marches in Nelamangala, Anekal and Doddaballapura in Bangalore Rural District, Superintendent of Police D Prakash told PTI. The central study team, on its second day of visit for assessing the water-situation, undertook an aerial study in Harangi, Kabini and Hemavathy catchment area. 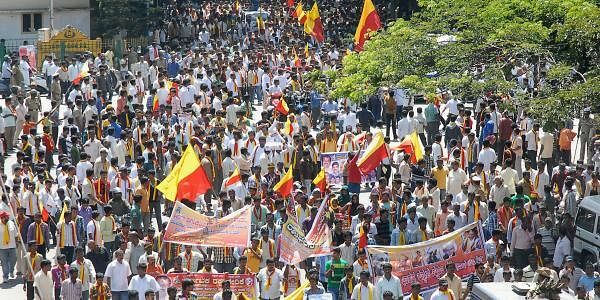 Peaceful protest marches were held in Mandya and Mysore districts with farmers resorting to "rasta roko" in Srirangapatna and Gejjalagere in Mandya district, hotbed of the stir, police said. The Karnataka government began releasing 9000 cusecs of water to Tamil Nadu after the Supreme Court asked it to abide by the September 19 directive of the Cauvery River Authority, headed by Prime Minister Manmohan Singh, till October 15. With the Kannada film industry supporting the bandh, Cinema houses remained closed. Cable TV operators have also joined the stir and barring news, are not beaming any entertainment programmes. Schools and colleges also remained closed. Meanwhile, a report from Mandya said some farmers, who staged a protest by standing on the banks of the Cauvery river, were taken into preventive custody. Farmers belonging to the "Cauvery Hitharakshana Samiti", an organisation spearheading the stir, continued their relay fast while some protesters burnt tyres in Mandya city. The situation in the district remained by and large peaceful with police keeping a close vigil on the situation, sources said. President of Cauvery Hitharakshana Samiti, G Madegowda who continued his relay fast for the third day today, demanded resignation of Chief Minister Jagadish Shettar for "not living up to his assurances". "The Chief Minister who had assured us that water will not be released to Tamil Nadu, acted swiftly on the Supreme Court direction to release water to the neighbouring state, neglecting the interest of the farmers of Cauvery basin", he told reporters. He also criticised MPs from the state "for not taking up the cause of the state and keeping mum". Appealing to former Chief Minister B S Yeddyurappa to urge the government to stop release of water,Madegowda warned that the agitation would turn violent if it was not stopped. Yeddyurappa asked his bete-noire Anantkumar to mount pressure on senior party leader L K Advani to meet the Prime Minister to seek justice for Karnataka. BJP leader V Dhananjaykumar, a loyalist of Yeddyurappa, slammed the Chief Minister for his 'failure' to protect the state's interest. "Power may come and go. It is not important. If one cannot protect the state's interest, such a person should demit office. Shettar is living in the confines of his house with police protection", said Kumar, whom Shettar recently sacked as Special Representative of Karnataka in Delhi. 'Raitha Sangha' leader Chandrasekhar hit out at BJP leaders for their attempts to politicise the Cauvery issue "to derive personal mileage".